While GNU/Linux was becoming firmly entrenched on web and mail servers and gaining a foothold in high-performance computing, the new generation of hackers was getting fed up with having to use Microsoft Windows on desktop PCs. If you were working as a web-site designer in the mid 90s, as I was, you could do a lot of the text stuff on the command line of a GNU/Linux box. You had a basic desktop, a choice of editing programs, and a functional web browser on GNU/Linux, and you could teach yourself how to create web sites (with a little help from the browser's View Source menu item). Creating web graphics from scratch was another matter. Figure 1-5. The outline of Tux the penguin, the Linux kernel mascot, as drawn by Larry Ewing and converted to EPS format by Neal Tucker. The GIMP (shown in Figure 1-6) was the first creative tool to be written for GNU/Linux, but it was also the first cool desktop application for the platform generally. It was the right program at the right time for a lot of people working on GNU/Linux systems in web-design start-ups and dot-coms. Figure 1-6. Version 1.2.1 of the GIMP, featuring multiple portraits of project mascot Wilber. Screenshot by Garrett LeSage. 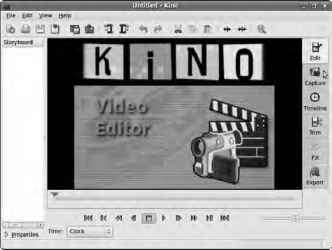 Around the same time, movie studios in the Los Angeles area began to use large numbers of GNU/Linux systems to render computer animation. Most of these movie programs were written for in-house use—software as the means to an end—although a few were later released as proprietary applications. 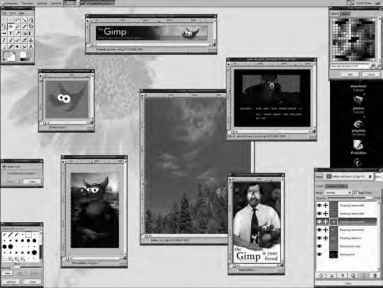 One exception was CinePaint, a program that developers working for the studios adapted from an early version of the GIMP. They were able to do this because of the four freedoms granted to them in the GNU GPL. Desktop software for GNU/Linux improved rapidly, although predictions of a "year of the Linux desktop," when Free Software would displace Microsoft Windows from PCs, proved premature. Other kinds of creative applications began to be released for GNU/Linux: Inkscape for vector artwork, Blender for 3D modeling, Scribus for desktop publishing, Audacity for editing audio, and more. Internet communities of developers and users grew up around these Free Software programs, improving them with new features, fixing bugs, and providing support to new users. As people from outside the GNU/Linux world got involved with these community projects, alternative versions for Windows and the Mac began to be released. Today, enough good Free Software applications are available that some people get by without using any proprietary software at all—and are still able to realize their creative projects.